It was windy and cold Friday morning when we arrived at Texas Motor Speedway for a behind the scenes tour with Ford. 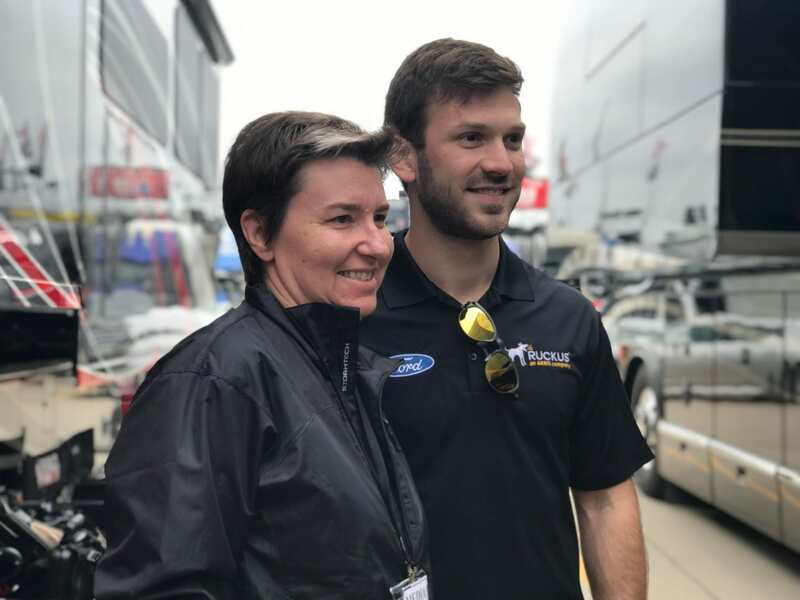 We’d been invited to join other media to tour the Ford tech Trailer and meet with Ford’s newest driver Daniel Suarez. Ford Racing PR expert Dan Zacharias spent the entire day Friday taking us on a tour through the garage areas. Our morning started with a walk through of Paul Menard’s hauler. As a part-time NASCAR fan, I’ve always wondered what it’s like on the inside of these trailers. Did you know they haul two cars in the top along with tons of parts inside? There’s also a lounge area where the driver has conferences, or spends time preparing for practice, etc. Next, we headed to the garage to watch the cars go through inspection before practice. While media and fans are allowed to photograph and record the cars during this process, shots under the hood or under the car are not allowed. Inspections are critical to a successful weekend. A car that fails pre-race inspection twice will start from the back of the grid. As part of our “behind the scenes” tour, we were given a look inside the Ford Tech Trailer. This is where I started to really geek out! Ford’s tech trailer is the hub of data and communications for Ford Performance teams. 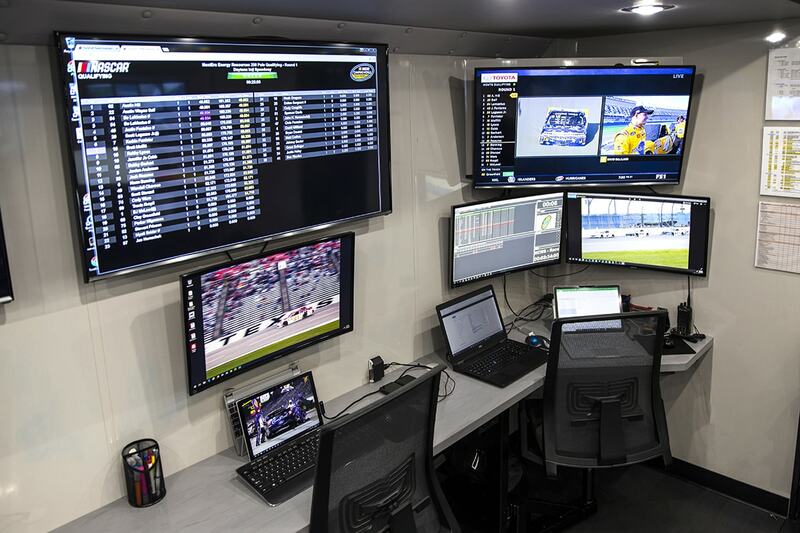 When Pat DiMarco, NASCAR Program supervisor for Ford Performance, pulled back the door to reveal 13 television sets, I felt like we were entering NASA’s control center. The tech trailer is able to process information critical to success on race day and beyond. Photos and data that’s collected and analyzed here is used by the crew chief’s to make critical decisions regarding race day strategy, provides information for simulators, and also gives Ford engineers data they can use for production vehicles. Ford uses multiple photographers that are able to photograph any car and take an average of 2500 photos per race. Those in the trailer can communicate with crews to zoom in on the smallest area of the car or track to see how a car was repaired on what might be impacting a car’s performance. 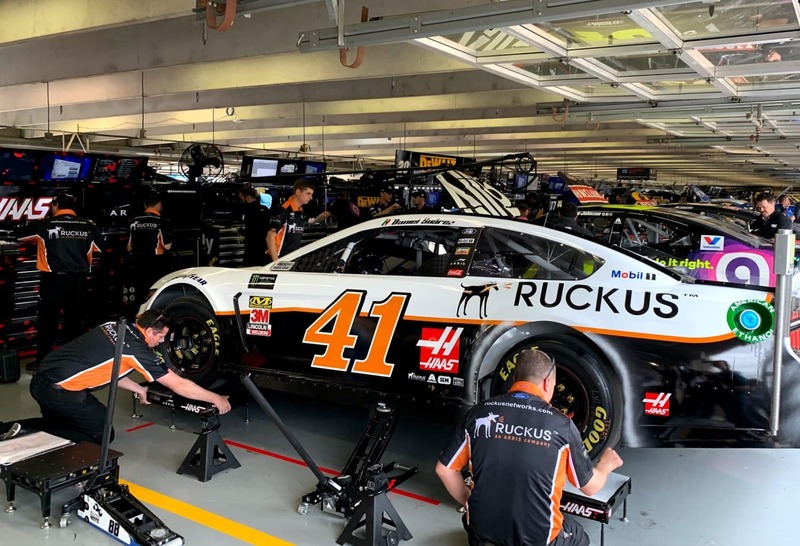 Teams use the information collected from weather, data, photos and more to help them communicate with drivers and pit crews and use it to maximize performance on a nearly instantaneous basis. Of course no visit to the track is complete without meeting a race car driver. 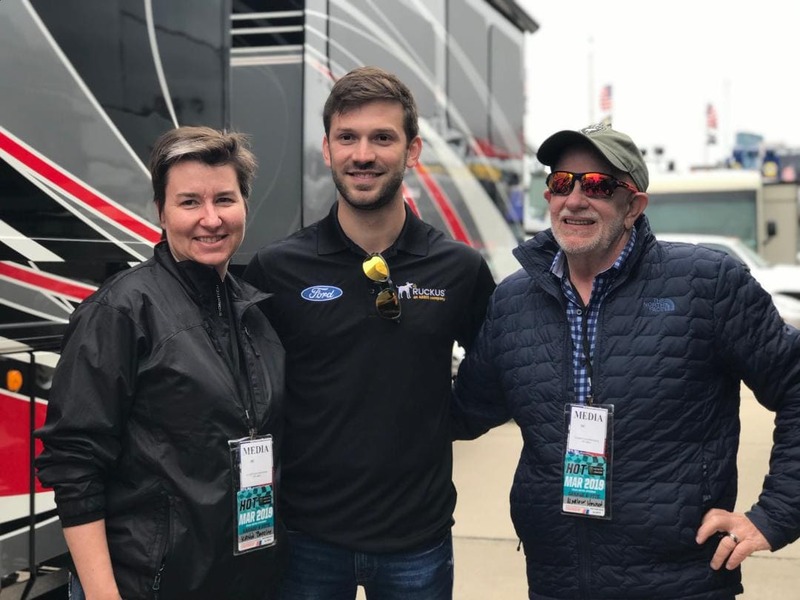 We met and discussed the weekend’s race and the life of a race car driver with Daniel Suarez, who placed third in the O’Reilly 500 race at Texas Motor Speedway. Daniel feels like TMS is the closest he has to a home track. It’s one of his favorite races because having friends and family at the track adds to the fun and reminds him of racing in Mexico. I asked him if he had any recommendations for my 8 year old NASCAR fan-what would you tell them to look for when watching a NASCAR race in person? “If I was a young fan today, use an app on iPad or computer and listen to the race. Listen to the communications between the driver and the crew chief, so you aren’t just watching the race but you are understanding the race. It helps to know why we make decisions about tires, etc,” Suarez answered. The Monterrey, Mexico, native, who won the 2016 NASCAR XFINITY series, drives the No. 41 Mustang Cup car for Stewart-Haas Racing. At 27 years of age, Suarez is the youngest driver on the team. Clint Bowyer, also driving a Mustang (No. 14) for Stewart-Haas Racing, placed second Sunday, making two out of the top three winners Mustang drivers. This season is the first season with Mustangs replacing the Ford Fusion, and so far they’re performing well. There are 14 full-time teams competing in the Ford Mustang, including Team Penske (3), Stewart-Haas Racing (4), Roush Fenway Racing (2), Wood Brothers Racing (1), Front Row Motorsports (3) and Go FAS Racing (1).